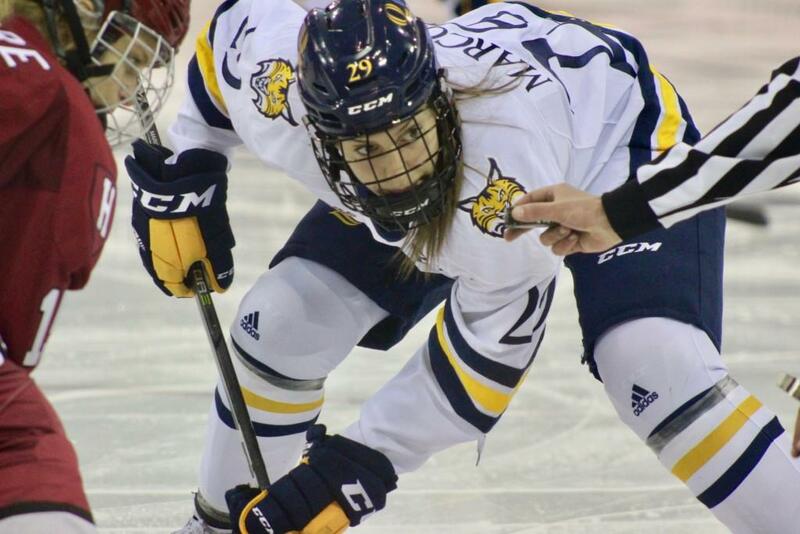 The Quinnipiac women’s hockey team (5-6-0 overall, 1-3 Eastern College Athletic Conference) will be looking to bounce back from a tough slate of conference play on the road last weekend tonight against the Union Dutchwomen (3-6-1 overall, 2-0-0 ECAC). Union has improved by leaps and bounds this season. Second-year head coach Josh Sciba has taken a team that won just five games last year to being fifth in the conference and without an ECAC loss so far. With just four upperclassmen on the roster, this is a Union team on the rise. Puck drop is set for 6 p.m. Friday night at the newly-named Frank Perrotti, Jr. Arena. Before game day though, here are the keys to the game. Prater recently returned to the Bobcats’ lineup from an extended injury absence, and she has made a major impact upon her return. In her four games played, she has two goals on eight shots, including a power play tally. The sophomore is a nice buffer between the top line and the freshman line that have been carrying the Bobcats early, and provides more balance to the offense. Look for Prater to continue her high-scoring ways. Like her team, Kosakowski has taken a big step forward this season. After not scoring any points her first year and just six last season, the junior defender currently leads the Dutchwomen in shots, goals, and points. She plays an aggressive style of defense, and her prowess as an offensive defender is among the best in the ECAC. Kosakowski is a veteran leader for Union, and a player to keep an eye on in this contest. Quinnipiac is definitely a second period team. The Bobcats have scored 11 of their 19 goals and outshot opponents 115-99 in the second frame this year. In spite of their dominance in the middle of games though, this often puts them in a position where they have to play from behind early or hold onto a narrow lead in the third period. If Quinnipiac can get a lead early, they can play a much looser brand of hockey. Sometimes the first goal is the biggest goal, and the Bobcats have to make sure it’s theirs for the taking. This seems obvious, but the Dutchwomen haven’t taken enough shots this year. They only average 19.1 shots per game, and that simply isn’t enough to compete deep into ECAC play. They have been aided by a solid 10.5 shooting percentage, but that is unsustainable for the course of the season. Giving up an average of 36.8 shots per game, Quinnipiac ought to be licking its chops to face such a porous defense. The Bobcats love taking shots from any angle they can get. Just ask Dartmouth goalie Christine Honor, who stopped an NCAA record 61 shots two weeks ago against Quinnipiac. Coco Francis is a good goalie, but she could use a little help from her own offense to spot her a lead against the Bobcats on Friday night. Be sure to check out @QBSN’s broadcast of Union vs. Quinnipiac at the TD Bank Sports Center in Hamden, Connecticut at 6 p.m. Jake Ziegler and Tom Krosnowski will be on the call for this matchup. Follow them on Twitter here: @JakeZiegler18 and @Tkro42.